Back row (left to right) - Wally Fukumoto (formerly of Woodfibre BC, Hastings Park Barbed Wire relocation centre, New Denver BC, Summerville Hostel Ontario, Hamilton), Aki Saisho (formerly of Fairview District Vancouver, Hamilton, Toronto), Ken Hashimoto (formerly of Duncan, Vancouver Island, Hastings Park Barbed Wire relocation centre, Lemon Creek BC, Lethbridge Alberta, Hamilton), Harold Shimoda (formerly of Port Moody BC, Angler Ontario internment camp, Hamilton, Shores Kondo formerly of Fairview District Vancouver, Hamilton) and Basil Shintani (formerly of Celtic Cannery BC, Steveston BC, Beamsville Ontario, Hamilton). 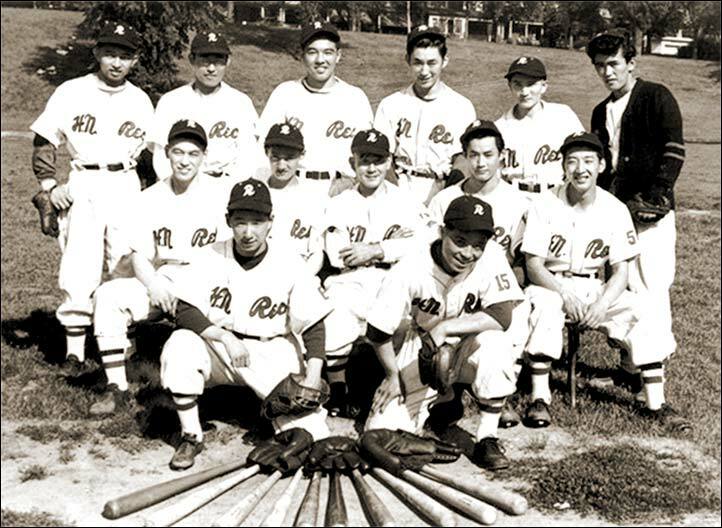 Middle row - Tom Kuwabara (formerly of Victoria, Hastings Park Barbed Wire relocation centre, Hamilton), Tom Kawamoto (formerly of Vancouver, Hamilton), Roy Yamamura (formerly of Asahi Baseball, Vancouver, Hamilton, Toronto), Mits Shimoda (formerly of Port Moody BC, Angler Ontario internment camp, Hamilton) and Tosh Hashimoto (formerly of Vancouver, Vernon BC, Hamilton). Front row - Herby Izumi (formerly of Chemainus, Vancouver Island, Hastings Park Barbed Wire relocation centre, Hamilton) and Mack Oikawa (formerly of Vancouver, Tete Jeune Road Camp, 12 Mile Hope-Princeton Highway Road Camp, Tashme, Hamilton, Toronto, Toronto Western Baseball).